A while back Brian Green sent me one of these Bud Light Tumblers which I took with me on a recent hike. All-in-all, I was pretty happy with the cup during the hike. Then, once I got back from the hike and posted a trip report, a few people noticed the cup in one of my YouTube video’s and has questioned me about them. So, I searched around on the internet to check out the source of these “cups” and learn a little more about them. What I found out is that these cups are actually made by Steve Carothers from SNCTOOL Outdoor Products and are actually called “Redneck Beer Cups.” As far as the cups themselves, they appear to be simple in design. These cups are actually recycled 16 oz Bud Light aluminum bottles in which the top has been cut off, and then the edge has been rolled. This creates a nice, smooth lip to drink from and even provides a bit more rigidity to the cup. At 1.3 oz, it is pretty lightweight. This one in particular has about a 14 oz capacity, so it is big enough for a cup of coffee. It is all one piece and considerably durable. The slender design makes it easy to store in lots of places inside, or outside a backpack. The wide mouth makes it easy to scoop water from a puddle or stream. This keeps them out of the landfills! But, to be fair, there are a couple of things that I do have a little concern about. Number one, being that it is made of aluminum, drinking a hot drink from it can burn my lips. However, I have found that if I don’t fill it up so much, the lip of the cup gets a little cooler a little faster, however, this means I have less drink. Another thing (and this may just be me) is that I found it a little awkward to sip hot drinks from because of how narrow the cup itself is. Once I drink it down to about half way, the top of the opening hits my nose when I turn the cup up to drink from. However, despite these minor nit-picks, I still think that these Redneck Beer Cups are interesting cups and would like to say thanks to Brian fro giving me the chance to check one out first hand. As well, I have decided that I wanted to give a few of these away also, so I headed back over to SNCTOOL Outdoor Products and placed an order for 3 more Redneck Beer Cups… which I am now giving away to 3 lucky people! Then leave the comment “I want a Redneck Beer Cup” on my FB page. I will actually be out-of-town all of next week, and then quite busy the week after, so to make it easy, I will let the contest run until my children get home from school on Tuesday, October 30th. At this time I will put all of the names in my daughter’s Halloween bucket and let her draw out 3 names. At that point, I will send a message to the winners on Facebook in which I will request their mailing address and get them mailed out asap. Unfortunately, due to shipping cost, I will be limiting this contest to those in the lower 48 only. I apologize to everyone else that is outside of this range. Disclaimer: I have no affiliation with SNCTOOL Outdoor Products. I paid for these cups with my own money and am hosting this small giveaway because I want to. 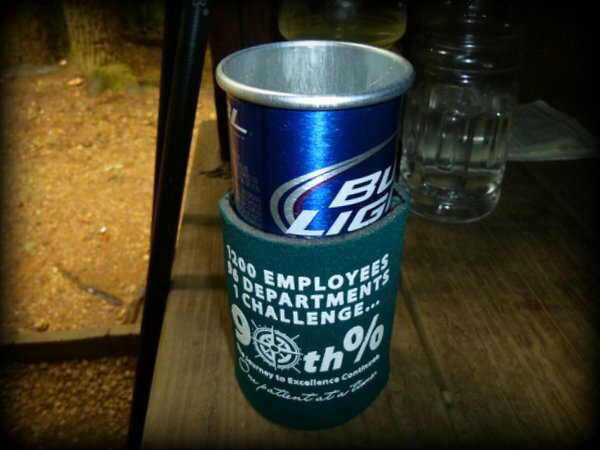 This entry was posted in Cups/Mugs, Gear, Give Aways and tagged Backpacking, Beer Can Cup, Bud Light Tumbler, Cups, Hiking, mugs, Redneck Beer Cup, SNCTOOL Outdoor Products. Bookmark the permalink. 3 Responses to Bud Light Tumbler Giveaway! Thanks for stopping by, and I apologize I limited this one to FB users…however, I believe that I will have another one coming up soon that will be available to anyone who visits and comments on my blog…I still have to get everything in order for it though… just be on the lookout!